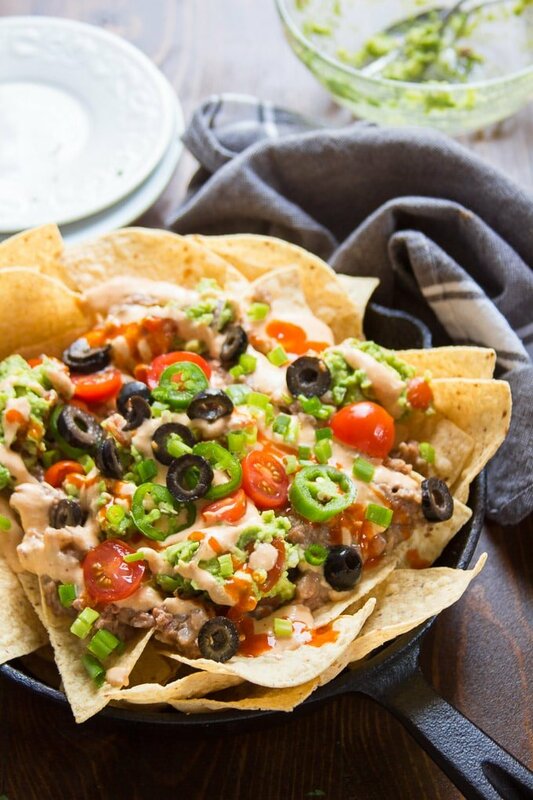 So, how does one make vegan nachos" There are 2 keys: (1) killer dairy-free cheese sauce, and (2) lots of other delicious toppings. There are lots of ways to make vegan cheese sauce, and I’ve already share recipes using cauliflower and sweet potatoes. Feel free to use one of those recipes if you like. This time around, I wanted to try something different, so I made my queso with a base of raw cashews and potatoes. The cashews supply richness, while the potato thickens and gives the sauce a nice, cheesy body. Boil the cashews and potato together ? no need to soak your cashews! Garlic, onion powder, nutritional yeast and some hot sauce add some cheesy flavor. Put everything into a food processor with a bit of non-dairy milk and blend until smooth and creamy.